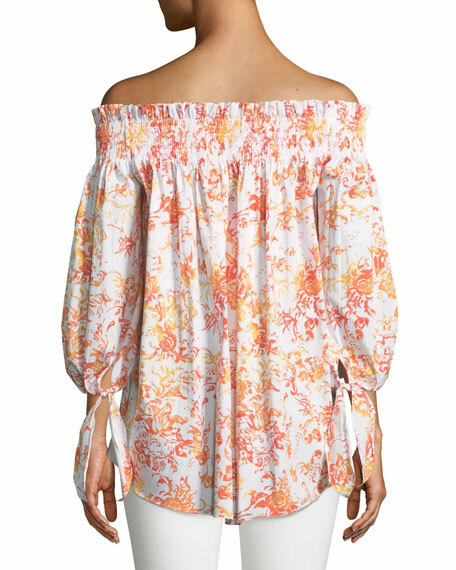 Caroline Constas "Lou" shirt with floral-print. Approx. length: 24.3"L down center back, 27"L from shoulder to hem. Eileen Fisher top in solid jersey-knit. V neckline. Three-quarter sleeves. Semi-fitted silhouette. Center front/back seam detail. High-low hem. Organic linen. Eileen Fisher top in solid jersey-knit. V neckline. Three-quarter sleeves. Semi-fitted silhouette. Center front/back seam detail. High-low hem. Organic linen. Hand wash. Imported. Model's measurements: Height 5'10"/177cm, bust 33"/84cm, waist 25.6"/65.2cm, hips 35.8"/91cm, dress size US 2-4/FR 34-36. 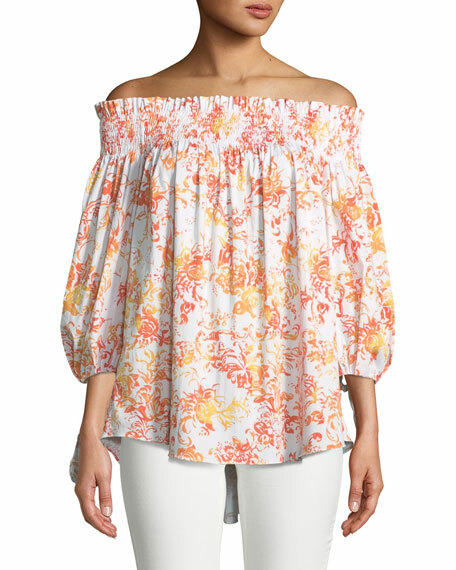 EXCLUSIVELY AT NEIMAN MARCUS Eileen Fisher easy stretch-lawn shirt. Approx. 32"L down center back. Tabbed collar; half-button front. Long sleeves; two-button cuffs. Yoked, pleated back. High-low hem. Relaxed fit. Organic cotton/spandex. Machine wash. Imported. Model's measurements: Height 5'10"/177cm, bust 33"/84cm, waist 25.6"/65.2cm, hips 35.8"/91cm, dress size US 2-4/FR 34-36. Finley "Belle" lace popover top. Split V neckline. 3/4 Flare sleeves. Rounded high-low hem. Relaxed fit. Lace, cotton/nylon; shell, bamboo rayon/spandex. Hand wash. Made in USA of imported material. Model's measurements: Height 5'10"/177cm, bust 33"/84cm, waist 25.6"/65.2cm, hips 35.8"/91cm, dress size US 2-4/FR 34-36.